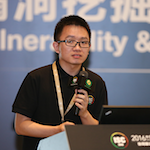 Qiang Li is a security researcher of Gear Team at Qihoo 360, mainly focus on vulnerability discovery and vulnerability analysis. He is currently working on cloud and virtualization security and discovered a lot of vulnerabilities in the last year and got 70+ CVE now. He has made some talks in security conference, Ruxcon 2017(Melbourne), ISC 2016(Beijing) and CanSecWest 2017(Canada).